Department of Pediatrics (Biggs, Turvey), British Columbia Children’s Hospital, University of British Columbia, Vancouver, BC; Departments of Pediatrics, and Microbiology, Infection and Immunology (Haddad), University of Montreal, CHU Sainte-Justine, Montréal, Que. ; Department of Pediatrics (Issekutz), IWK Health Centre, Dalhousie University, Halifax, NS; Division of Immunology and Allergy (Roifman), Hospital for Sick Children; Department of Pediatrics (Roifman), University of Toronto, Toronto, Ont. Severe combined immunodeficiency is a medical emergency that can potentially be cured by hematopoietic stem cell transplantation or gene therapy (in specific diseases). Outcomes for severe combined immunodeficiency are greatly improved by early diagnosis and treatment. 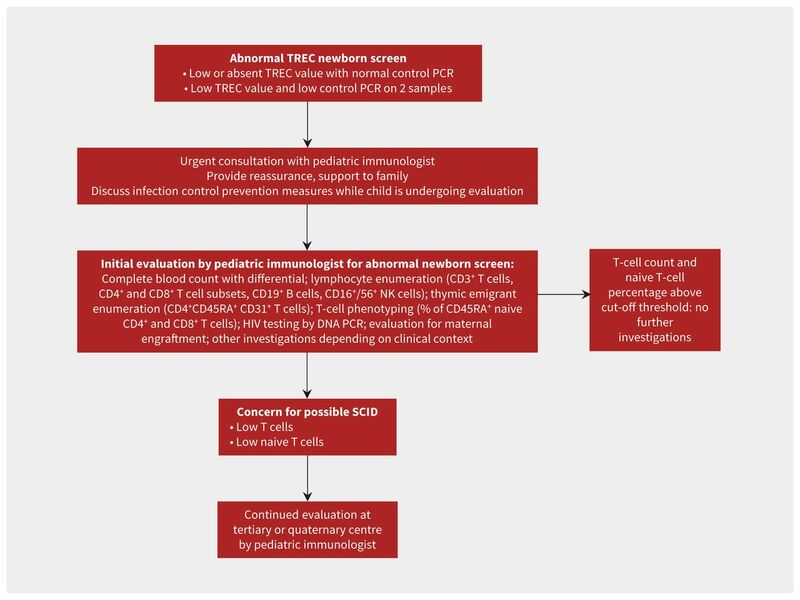 The newborn screen for severe combined immunodeficiency evaluates for T-cell lymphopenia using a T-cell receptor excision circle assay, which can be performed on the dried newborn blood spot. Infants with a positive newborn screen for severe combined immunodeficiency require referral to a clinical immunologist, as well as precautionary measures against infection while they undergo evaluation. In Canada, severe combined immunodeficiency is diagnosed at a mean age of 4.2 months and carries a mortality rate of 30%, with nearly 60% of deaths caused by infection before patients are able to receive a transplant.7 The clear need for early diagnosis and treatment led to the development of a newborn screen for severe combined immunodeficiency, known as the T-cell receptor excision circle assay.8 This assay was established in 2005 and is carried out on dried blood spots (also known as the Guthrie card), which are already taken as part of the routine newborn screen.9 In 2013, a newborn screening program for severe combined immunodeficiency was introduced in Ontario, following an application made by Immunodeficiency Canada, a national nonprofit advocacy organization with a mission to study and cure inherited immunodeficiency. The screening program has since expanded to the Maritime provinces and is being established in several other provinces and territories. This review informs physicians who may treat newborns in their practice (e.g., family physicians, obstetricians, pediatricians) on how to approach patients and counsel families who are faced with an abnormal screen for severe combined immunodeficiency. We describe the epidemiology, diagnosis and screening of this disorder and provide a brief summary of available treatments (Box 1). To augment our clinical expertise, we searched PubMed and Web of Science for “newborn screening for severe combined immunodeficiency,” and various combinations of “newborn screening,” “neonatal screening,” “severe combined immunodeficiency,” “SCID,” and “TREC.” We also studied seminal papers on the diagnosis and treatment of primary immunodeficiencies. Recent articles and those with the most robust level of evidence, such as large-scale population-based studies and those using Markov and decision analysis models to estimate cost-effectiveness of newborn screening for severe combined immunodeficiency, were selected. Of the 126 papers reviewed, 42 were used in this review. What is severe combined immunodeficiency? Note: SCID = severe combined immunodeficiency. Why is early diagnosis and treatment critical? The cost of delayed diagnosis of severe combined immunodeficiency is substantial, as survival outcomes vary greatly depending on the timing of treatment and infection status. Retrospective studies show that infants who receive a hematopoietic stem cell transplant within the first 3.5 months of life have a greater than 90% likelihood of survival, even in the absence of a matched sibling donor.5,6 For those who receive a transplant after 3.5 months of age, overall survival rate falls to 70%,6 with rates varying between 50% and 90% depending on the infection status at the time of transplant5 and on the donor type. Because infants may appear outwardly healthy until they begin experiencing recurrent infections or failure to thrive, by the time the diagnosis is made, the early window of opportunity to achieve an optimal outcome has typically passed. Children may die from severe infection before definitive treatment, or face worse transplantation outcomes than those in whom the disease is identified earlier in life.4 This knowledge of the difference that early diagnosis makes regarding outcomes fuelled the search for a biomarker that could be used to screen for severe combined immunodeficiency in the newborn period, which led to the discovery of the T-cell receptor excision circle assay. What is the newborn screen and how well does it perform? Pictorial explanation of T-cell receptor excision circle (TREC)–based newborn screen for severe combined immunodeficiency (SCID). The healthy infant (A) has an intact immune system; the thymus produces a normal repertoire of T cells. As unique T cells are produced, TRECs are released into the systemic circulation and can be quantified on the newborn blood spot. Despite appearing healthy externally, the infant with SCID (B) has very low or absent T-cell production. This leads to undetectable numbers of TRECs on the newborn screen, facilitating early diagnosis of SCID. The false-positive rate for the T-cell receptor excision circle assay refers to the percentage of infants with low T-cell receptor excision circle results requiring follow-up T-cell enumeration, who ultimately have a normal T-cell number.10 This rate varies depending on the cut-off values used for what are considered both normal T-cell receptor excision circle values and normal T-cell numbers. Infants have abundant T cells (ranging from 2500 to 5500/μL); different locations that do the newborn screen have used varying T-cell value cut-offs (typically 1500 or 2500/μL), in combination with T-cell phenotypic analysis, to decide which infants require further evaluation.10,30 This has led to great variation in false-positive rates between centres.10 Although low false-positive rates risk missing cases of severe combined immunodeficiency, higher rates may also lead to evaluating children who ultimately do not have the disorder. This is a challenge at present as Canada implements the newborn screen, and highlights the need for further research to determine the optimal cut-off values for T-cell receptor excision circles and T cells. Which other conditions may lead to an abnormal screen? Which forms of immunodeficiency are not identified by the newborn screen? Deleterious mutations in at least 20 genes have been associated with the development of severe combined immunodeficiency.37 Most of these are identifiable by the T-cell receptor excision circle assay; however, certain forms of the disorder can evade detection by the newborn screen. Examples include severe immunodeficiencies caused by ZAP70 and MHC class II deficiencies. These conditions are caused by defects in T-cell development that occur after the formation of the T-cell receptor and can therefore lead to variable results in T-cell receptor excision circle assays, ranging from low to normal.38–41 Note that the assay does not screen for all primary immunodeficiencies. It will not identify immunodeficiencies in which T cells are mildly affected or unaffected.37 These would include disorders of the innate immune system, such as complement deficiency or innate immune signalling defects, as well as primary B-cell disorders such as X-linked agammaglobulinemia. Although newborn screening for severe combined immunodeficiency is a huge advance for this extremely vulnerable patient population, it cannot replace “old-fashioned” clinical vigilance and acumen. What is the approach to a patient with an abnormal screen? Suggested initial approach to a patient with an abnormal newborn screen for severe combined immunodeficiency (SCID).17 PCR = polymerase chain reaction, TREC = T-cell receptor excision circle. In cases of confirmed severe combined immunodeficiency, patients should be started on a prophylactic regimen to prevent infections, which typically includes trimethoprim-sulfamethoxazole beginning at six weeks of age to prevent Pneumocystis jiroveci pneumonia, as well as immunoglobulin replacement therapy through administration of intravenous or subcutaneous immunoglobulins. What support should parents receive? Learning that their seemingly healthy newborn may have a life-threatening diagnosis is devastating for new parents. These results arrive in the newborn period, when parents may be feeling particularly vulnerable, and when there is risk for developing postpartum depression.17 Sensitivity on the part of care providers is essential to help families cope while their child is undergoing evaluation. Practitioners should explain that the abnormal newborn screen alerts to the possibility of an immune system problem, but is not a definitive diagnosis. Emphasizing the screening nature of the test helps parents understand that although further workup is essential, false positives occur, and their child could still be identified as healthy. For those patients who are ultimately found to have severe combined immunodeficiency, therapies are available to treat the immunodeficiency, and those treated early in life have better outcomes. Prompt referral to a pediatric immunologist is important, not only for an urgent immune evaluation, but also so that parents may receive further information on the screen and guidance on infection prevention. Parents may feel a range of emotions upon learning about an abnormal newborn screen, including grief, shock and fear of losing their child, and may not believe the results.17 Providers can ask directly about the emotional status of affected families and evaluate for postpartum depression. Social workers may provide psychosocial support to families and connect them with resources to facilitate additional medical visits, such as transportation assistance. Some useful resources for physicians and families are provided in Box 3. The opportunity to identify severe combined immunodeficiency early in life has transformed outcomes for this otherwise fatal condition.10 Introducing this assay into newborn screening programs throughout Canada has the potential to save lives and prevent suffering of patients and families affected by this condition. Early treatment will decrease total clinical costs compared with those for children who are diagnosed and treated later in life. Continued evaluation of different cut-off levels for T-cell receptor excision circle and T-cell values will aid in arriving at best practices for use of the screen, and future research will aim to find new screening modalities capable of identifying additional primary immunodeficiencies that may also benefit from early recognition and treatment. Other unanswered questions are outlined in Box 4. What is the best approach toward infants identified by newborn screening with idiopathic T cell lymphopenia who do not meet the criteria for severe combined immunodeficiency? Are there additional screening modalities that should be introduced into the newborn screen to identify other primary immunodeficiencies? Competing interests: Dr. Haddad reports grants from CSL Behring and consulting fees from Leadiant Biosciences, outside the submitted work. No other competing interests were declared. Contributors: Catherine Biggs and Stuart Turvey contributed to the conception and design of the article, and drafted the manuscript. Elie Haddad, Thomas Issekutz and Chaim Roifman contributed to the design of the article and critically revised the article for important intellectual content. All of the authors gave final approval of the version to be published and agree to be accountable for all aspects of the work. Funding: Catherine Biggs is supported by the Canadian Allergy, Asthma and Immunology Foundation/AllerGen Research Fellowship, the Primary Immune Deficiency Treatment Consortium grant for primary immune deficiencies and the AllerGen Emerging Clinician-Scientist Research Fellowship. This work was supported by AllerGen NCE Inc. (the Allergy, Genes and Environment Network), a member of the Networks of Centres of Excellence Canada program. The Primary Immune Deficiency Treatment Consortium (PIDTC; U54 AI 082973) is part of the National Center for Advancing Translational Science (NCATS) Rare Diseases Clinical Research Network, an initiative of the Office of Rare Diseases Research, NCATS. The PIDTC is funded through a collaboration between NCATS and the National Institute of Allergy and Infectious Diseases. Stuart Turvey holds the Aubrey J. Tingle Professorship in Pediatric Immunology and is a clinical scholar of the Michael Smith Foundation for Health Research.
. Primary immunodeficiency diseases: a practical guide for clinicians. Postgrad Med J 2009;85:660–6.
. Primary immunodeficiencies. J Allergy Clin Immunol 2010; 125: S182–94.
. Why newborn screening for severe combined immunodeficiency is essential: a case report. Pediatrics 2010;126:e465–9.
. Neonatal diagnosis of severe combined immunodeficiency leads to significantly improved survival outcome: the case for newborn screening. Blood 2011;117:3243–6.
. Transplantation outcomes for severe combined immunodeficiency, 2000–2009. N Engl J Med 2014;371:434–46.
. Long-term clinical outcome of patients with severe combined immunodeficiency who received related donor bone marrow transplants without pretransplant chemotherapy or post-transplant GVHD prophylaxis. J Pediatr 2009;155:834–40.e1.
. Severe combined immunodeficiency (SCID) in Canadian children: a national surveillance study. J Clin Immunol 2013;33: 1310–6.
. The long quest for neonatal screening for severe combined immunodeficiency. J Allergy Clin Immunol 2012;129:597–604.
. Development of population-based newborn screening for severe combined immunodeficiency. J Allergy Clin Immunol 2005;115:391–8.
. Newborn screening for severe combined immunodeficiency in 11 screening programs in the United States. JAMA 2014;312:729–38.
. Severe combined immunodeficiency — a retrospective single-center study of clinical presentation and outcome in 117 patients. J Pediatr 1993;123:564–72.
. Positive family history, infection, low absolute lymphocyte count (ALC), and absent thymic shadow: diagnostic clues for all molecular forms of severe combined Immunodeficiency (SCID). J Allergy Clin Immunol Pract 2015;3:585–91.
. Severe combined immunodeficiency: recent developments and guidance on clinical management. Arch Dis Child 2015;100:667–72.
. Omenn syndrome: inflammation in leaky severe combined immunodeficiency. J Allergy Clin Immunol 2008;122:1082–6.
. Establishing diagnostic criteria for severe combined immunodeficiency disease (SCID), leaky SCID, and Omenn syndrome: the Primary Immune Deficiency Treatment Consortium experience. J Allergy Clin Immunol 2014;133:1092–8.
. The Wisconsin approach to newborn screening for severe combined immunodeficiency. J Allergy Clin Immunol 2012;129:622–7.
. Treatment of infants identified as having severe combined immunodeficiency by means of newborn screening. J Allergy Clin Immunol 2017;139:733–42.
. How I treat severe combined immunodeficiency. Blood 2013;122:3749–58.
. Laboratory technology for population-based screening for severe combined immunodeficiency in neonates: the winner is T-cell receptor excision circles. J Allergy Clin Immunol 2012;129:607–16.
. Newborn screening for severe combined immunodeficiency; the Wisconsin experience (2008–2011). J Clin Immunol 2012;32:82–8.
. Incidence of severe combined immunodeficiency through newborn screening in a Chinese population. J Formos Med Assoc 2015;114:12–6.
. Newborn screening for severe T and B cell immunodeficiency in Israel: a pilot study. Isr Med Assoc J 2013;15:404–9.
. Prospective neonatal screening for severe T- and B-lymphocyte deficiencies in Seville. Pediatr Allergy Immunol 2016;27:70–7.
. Newborn screening for severe primary immunodeficiency diseases in Sweden — A 2-year pilot TREC and KREC screening study. J Clin Immunol 2017;37:51–60.
. Ontario newborns now screened for SCID. CMAJ 2013;185:E616.
. Cost-effectiveness/cost-benefit analysis of newborn screening for severe combined immune deficiency in Washington State. J Pediatr 2016;172:127–35.
. A Markov model to analyze cost-effectiveness of screening for severe combined immunodeficiency (SCID). Mol Genet Metab 2011;104:383–9.
. Newborn screening for severe combined immunodeficiency and T-cell lymphopenia in California: results of the first 2 years. J Allergy Clin Immunol 2013;132:140–50.
. TREC-based newborn screening for severe combined immunodeficiency disease: a systematic review. J Clin Immunol 2015;35:416–30.
.; Pediatric AIDS Clinical Trials Group. Lymphocyte subsets in healthy children from birth through 18 years of age: the pediatric AIDS clinical trials group P1009 study. J Allergy Clin Immunol 2003;112: 973–80.
. Cause of death in neonates with inconclusive or abnormal T-cell receptor excision circle assays on newborn screening. J Clin Immunol 2011;31:962–7.
. T-cell receptor excision circles of newborns are associated with gestational age: data from Wisconsin newborn screening for severe combined immunodeficiency. J Allergy Clin Immunol 2011; 127: AB146.
. Profound T-cell lymphopenia associated with prenatal exposure to purine antagonists detected by TREC newborn screening. J Allergy Clin Immunol Pract 2017;5:198–200.
. Deficient T-cell receptor excision circles (TRECs) in autosomal recessive hyper IgE syndrome caused by DOCK8 mutation: implications for pathogenesis and potential detection by newborn screening. Clin Immunol 2011;141:128–32.
. Newborn screening for SCID identifies patients with ataxia telangiectasia. J Clin Immunol 2013;33:540–9.
. Newborn screening for severe T and B cell lymphopenia identifies a fraction of patients with Wiskott–Aldrich syndrome. Clin Immunol 2014;155:74–8.
. History and current status of newborn screening for severe combined immunodeficiency. Semin Perinatol 2015;39:194–205.
. Evaluation of the T-cell receptor excision circle assay performances for severe combined immunodeficiency neonatal screening on Guthrie cards in a French single-centre study. Clin Immunol 2014;150:137–9.
. Thymic function in MHC class II-deficient patients. J Allergy Clin Immunol 2013;131:831–9.
. Defining combined immunodeficiency. J Allergy Clin Immunol 2012;130:177–83.
. Limitation of TREC-based newborn screening for ZAP70 severe combined immunodeficiency. Clin Immunol 2014;153:209–10.
. Impact of viral reactivations in the era of pre-emptive antiviral drug therapy following allogeneic haematopoietic SCT in paediatric recipients. Bone Marrow Transplant 2013;48:803–8.